It is specially prepared for Thirukarthigai Day (Karthigai Deepam festival) in the districts of Kanyakumari, Tirunelveli and Tuticorin. Hand-ground raw rice flour is mixed with powdered ‘karuppatti’ (palm jaggery) and coconut gratings. This flour mixture is then stuffed in the tender palm leaves and cooked in steam for a while. 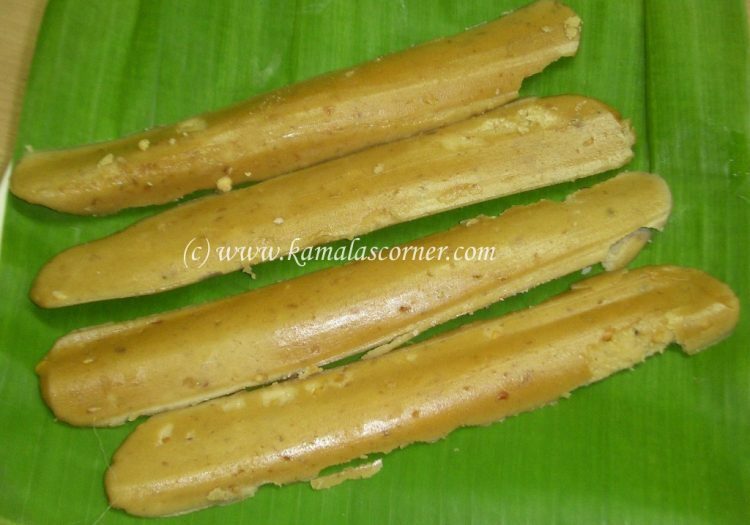 Now people started using rice flour and jaggery or sugar and making this Kozhukattai. Add half cup water to the jaggery powder and bring to boil. When it starts boiling, remove it and strain it. In a broad vessel put the rice flour, coconut gratings, ginger powder and cardamom powder. Mix it. Add the jaggery water and make a dough. If necessary add little hot water to get correct consistancy. The dough should be slightly looser than the chapati dough. Clean the palm leaves and cut the center portion about 4 to 5 inch long. Open the leaves and stuff the dough lengthwise and close the leaves. Tie with a thick thread. (You can use thinly cut palm leaves as thread). Finish all the dough like this. Arrange it in a idli plate and steam it in the Idli vessel for fifteen to twenty minutes. Remove and gently take out the kozhukattai from the leaves. Note: If you do not get Palm leaves, you can just take out a lemon size dough and press it with your fingers and make the Kozhukattai. You can dry fry a tablespoon of green gram dhal till it become light brown and add to the flour. Thank you very much for your comments. 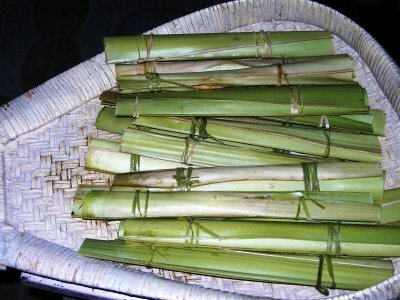 Palm leaves are sold only during Karthigai festival days in specific markets. I used to get it from Aminjikarai market or in Triplicane market. Thanks for keeping the traditional recipes alive.I've been living in Australia for about seven years now and all traditional foods from Tirunelveli makes me nostalgic. I will try this someday soon. Thanks again for sharing this. JD. I am new to your blog. I was viewing quite a few recipes – palm leaves kozhukattai is new to me and your kolams – I was amazed. You are indeed gifted to possess such an art/skill. They are fabulous. Let the festival of lights bring you every joy in your life. Amazing receipe . Could you please give some tips for kutanchoru? Thank you Selva. “Kutanchoru” means, people gather in one place and cook together a dish with the ingredients which they brought. Normally rice is cooked with vegetables and spices in one pot. Kutanchoru is a one pot meal. We need your address and phone no for some reference to arrange street food festival.Pls contact us . Thank you for writing. Can you please send me more details to my mail [email protected], since I am now travelling. Excellent recipe.. Will try this for this year’s Karthika Deepam.. Thank you so much.